After publishing Latent needs are overplayed as an innovation dynamic, I got a lot of feedback. Plenty of agreement, but also some good counterpoints. And in reading through some of them, I realized that there is something to this. A lot of people are convinced that whole markets are waiting to be built based on people not really understanding their own needs. Or if not whole markets, at least new products that can find success based on unrealized needs. I submit that there is an antidote to this problem. That the issue is not that customers either do not know or cannot articulate their needs, or jobs-to-be-done. It’s that follow-up is required. Are you asking ‘why’ enough? As you interview a customer, you’re seeking their jobs-to-be-done, along with the associated outcomes that are needed to be successful in that job. Here’s the thing: you’re going to get superficial responses initially. Not because people don’t realize their own needs. Rather, they’re fixated on current processes and product features (this is the ‘faster horses’ issue). We go with what we can recall the easiest. It’s a natural phenomenon, documented well by Daniel Kahneman in his book Thinking, Fast and Slow. But it can result in limited insight into what they really value and seek to accomplish. When interviewing a customer, listen for your internal voice that says, “this need is not the real one”. You’ll know it, because it will be deeply entwined in the current product features. That’s when delivering a well-timed ‘WHY?’ will make a difference. This is not a novel concept. Indeed, it’s part of the lean six sigma methodology, used to get at the root cause of issues (here’s a Jeff Bezos example). But it’s perhaps not so obvious to use WHY in the pursuit of latent needs. I have found asking ‘WHY’ to be a great method for penetrating the “what I easily know” bias. Two examples below – one from a former HPer, one from me – relate the value of understanding ‘WHY’. We were asked to figure out how to get HP into the large format graphic plotter business. In one customer visit after another we were told that accuracy was the critical requirement. The current product to beat utilized a magnetic x-y motor moving over a precisely grooved steel surface that was mounted on a super-flat granite slab weighing the better part of a ton. This $50,000 product had accuracy that was hard to beat. During a visit to a semiconductor design company, I asked them to show us how they used these highly accurate drawings. We were ushered into a room where engineers were verifying the design of multiple chip layers. They did this by taping the drawings, each roughly 3×4 meters, to a large light table, with each drawing carefully aligned with the one below. They would then crawl around on top of the light table, literally on their hands and knees, sighting down through the layers of transparent Mylar, and checking the alignment and design of each layer. “See,” said our host, “that’s why we need the accuracy.” But, in fact, this application did not use the accuracy at all. It depended, instead, only on repeatability between one drawing and the next. Repeatability is fairly cheap and easy to accomplish. Accuracy is really, really expensive. After a thorough survey of the market, we decided that repeatability was the crucial specification in most applications, so we traded off accuracy for lower cost. The resulting product employed a radical new plotting mechanism that delivered extremely good repeatability, fairly poor accuracy, and sold for under $15,000. Within three years its sales exceeded 50% market share. I performed a jobs-to-be-done exercise with multiple customers. One job that several talked about was the need to get more people ‘down-voting’ ideas. What they were seeing was that people tended to be positive only, or they didn’t rate an idea at all. Hence the desire for more down-votes. But I asked for more than that. “Why?” Because they wanted better distinguishing of the good ideas from the bad, and getting only up-votes made that hard.The real need was better ways to distinguish ideas. The request for ways to increase down votes was the way they expressed that.Customers were providing feedback on the current process/features when they talked about more down-votes. But pressing them to understand why unveiled the real need. 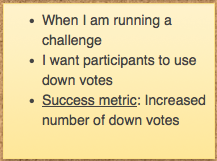 And there are a lot of other ways to stratify ideas besides increasing down-votes. Marvin got to the real need here by pursuing customers’ responses through ‘why’. Note that repeatability wasn’t an unrealized need. Customers were doing this with every design! They indeed realized they needed to do it. It’s just that they were caught up in the current process they used when expressing This insight was used later in the product roadmap to address the real need. Rather than push to get users to do something they were uncomfortable with – down voting – there are ways to leverage what they actually do. In both cases, customers were providing feedback about current process and product features. But with some digging, the root job-to-be-done was secured. Nothing latent or unrealized. Just some work penetrating the natural way people think: starting with what they can easily recall. Dig deeper with WHY. Absolutely. As I’ve noted, product management is like therapy. We need to keep probing, facilitating a dialog with the prospects we interview, to uncover the core needs. We don’t ask “Why?” a fixed number of times; we stop when we get to the basic needs that our solution will never fully address. At the end of a session, both the therapist and the subject have gained insight. Hey Roger – wow, you had this nailed back in 2005. Very cool. I like the question you pose…when to stop asking ‘why’. Because it’s essentially going up the chain of needs, which eventually becomes so fundamental and wide that it wouldn’t be useful (e.g. “So I can continue to exist on Earth”). Love the article! And I would add what Simon Sinek says with his golden circle: “people don’t buy what you do, they buy WHY you do it”.